He said he was off to check out my blog for some Christmas inspiration and I was really surprised when he said my decor and ideas inspired him. I did not realise I had an avid following searching for design and style tips! He had created a beautiful tablescape by spraying home picked eucalyptus silver. I was suitably impressed but a bit taken back that he had searched my old blog for inspiration but I remembered I met Andrew through my blog resulting in me helping him design and create his wedding many years ago in Ronda when I first started my business. I don´t post up much these days about styling and decorating both homes and events which has been my vocation and passion for most of my life and I thankfully have been able to have a career doing this for 30 years. I know the reasons why my lack of design and inspiration posts happened. I got swept up in taking charge of my business after being shafted, no bad thing as taking control was the best thing that happened to me but it was a lot of work at the time! The passing of my father also took the wind out my sails combined with the changeover from my beloved blog on Blogspot I had started 11 years ago over to the new website which to be honest left me nervous about what to post and how to do it properly, it has been a trial and error for the past two years. There were many reasons actually, but this coming year I have decided to do more of my decor inspiration posts again to share with you when I have the time, not just about weddings, but interiors and lifestyle styling as this is what I have done as a job for most of my life before I embarked into the wonderful world of weddings! I loved my sparkly cursor and snow effect at Christmas on my Blogspot which I cannot do on WordPress but hey ho I am going to make it magical again. I will share what I do, what inspires me, what I love and share trends with you which I am pretty spot on at predicting as I avidly watch the fashion and interior businesses which always follow on and translate into wedding design and styling. 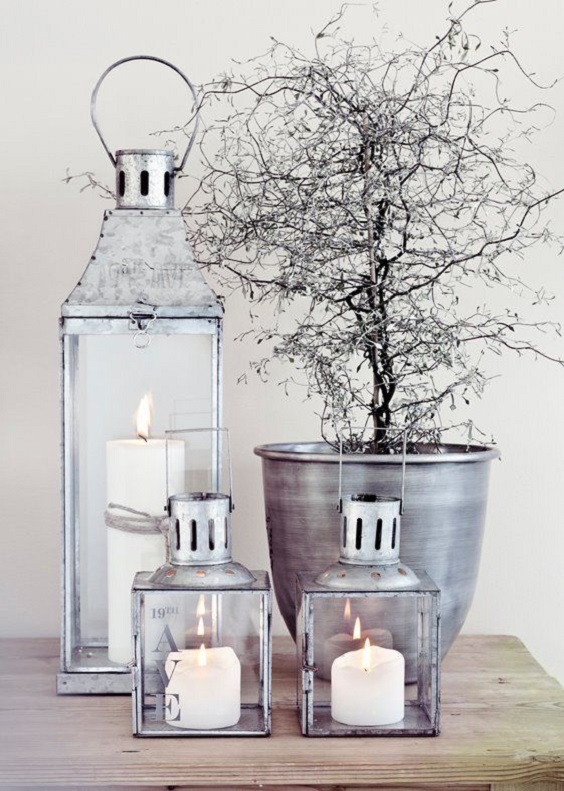 So I will start with how I decorate my home once the Christmas decorations come down and how I do it. Firstly I love Christmas, it is such a magical time of year and a decorators dream. I seem to have accumulated so many beautiful Christmas collections that I have to remove a lot of things before I start our Christmas decor. So I pack away ornaments, photos and even pictures on the walls, cushions are replaced and all our Christmas paraphernalia from the cute snow village to my snow globe collection I have amassed over the years are displayed. I have to leave the clear down after Christmas until the 6th January as here in Spain we have the 3 Kings but before this gradually I recover areas back, one day I pack away the snow globes, then another day the mini Christmas trees are packed up, I do it slowly so it is not drastic and the main Christmas tree comes down last. I love the winter and neutral colour schemes, grey is one of my favourite colours so all the key pieces in my home are various shades of grey such as my sofas, dining chair upholstery and some furniture. It is such a versatile colour that can easily be changed during the seasons from whites, soft creams and silvers for winter to hot pinks, olive greens and blues for the summer months. 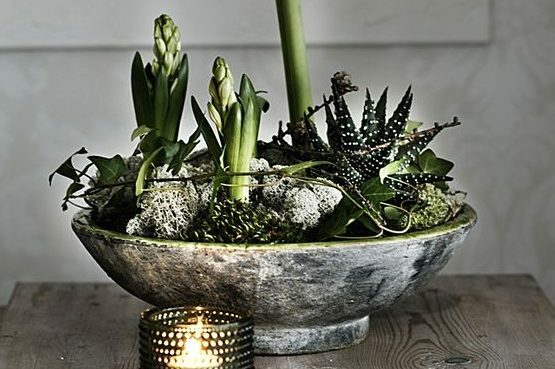 I start the Christmas clear down by gradually replacing the festive decor with winter flowering bulb arrangements, twig displays and still keep quite a few fairy lights around for that winter sparkle and coziness. I use the battery operated fairy lights on copper wire. 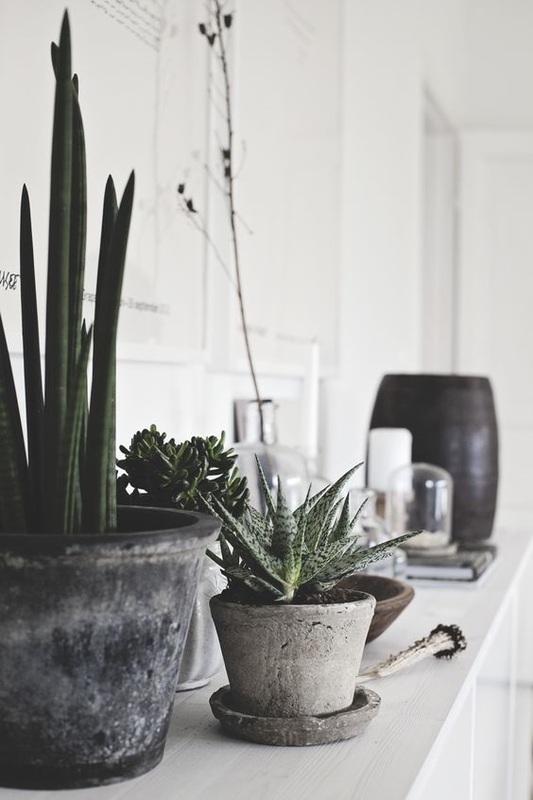 I also like the clean and lean look for the post holidays so I reclaim a lot of surface space and keep it simple, I may create one beautiful arrangement for our sideboard and have only this with our framed photos back out on display. I hate clutter and by the time January arrives I am quite pleased to be packing away Christmas and blowing the Christmas cobwebs out the door! Here are just some inspirations that I would replace our Christmas decor with during the January and February months before the spring arrives that I have found on Pinterest. Amaryllis are one of my favourite winter bulbs, they make such a statement and last for ages, along with the gorgeous aroma of hyacinth bulbs. 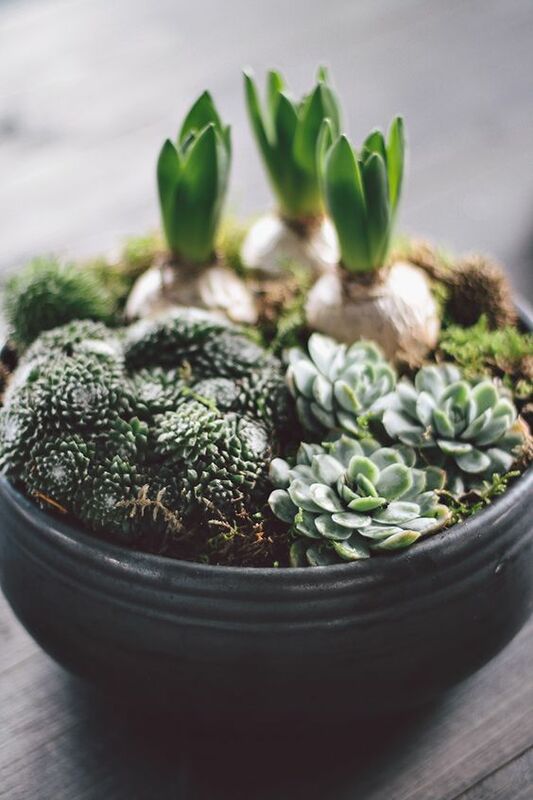 I buy these bulbs from our local garden centre and plant them into simple terracotta or white washed pots, cover them with moss and intertwine with small fairy lights for the dark evenings which are so pretty and still bring that winter glow and magical look. 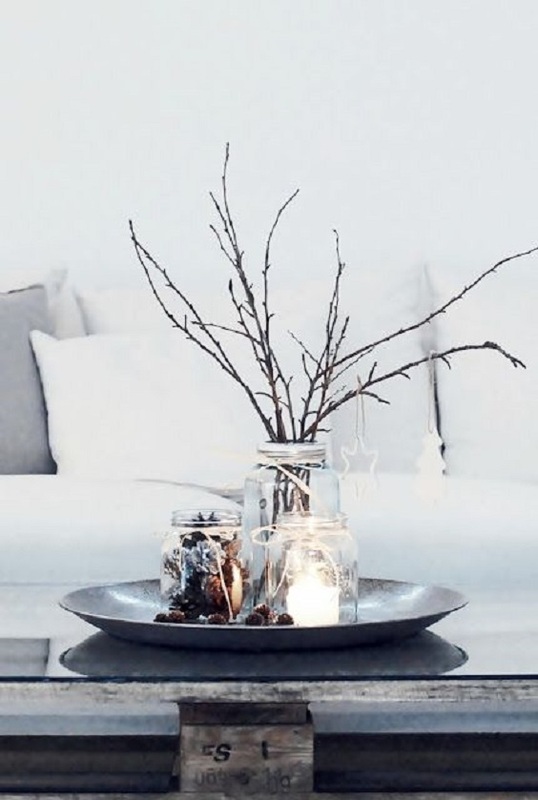 To keep the simplicity after Christmas I dig out my plain glass containers too and fill them with winter twigs, pine cones, moss and more fairy lights. 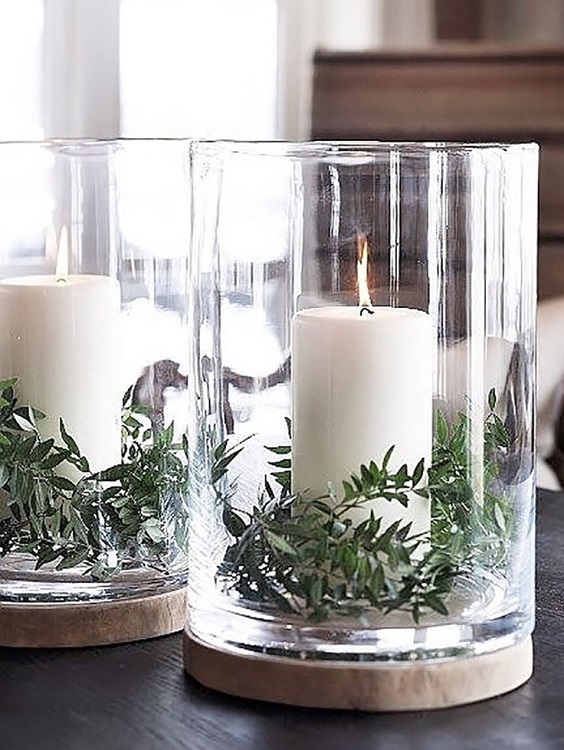 Candles are everywhere in my home, beautifully scented candles for me are a must and I love using simple white candles and adding in a bit of fresh greenery to display them in statement glassware. 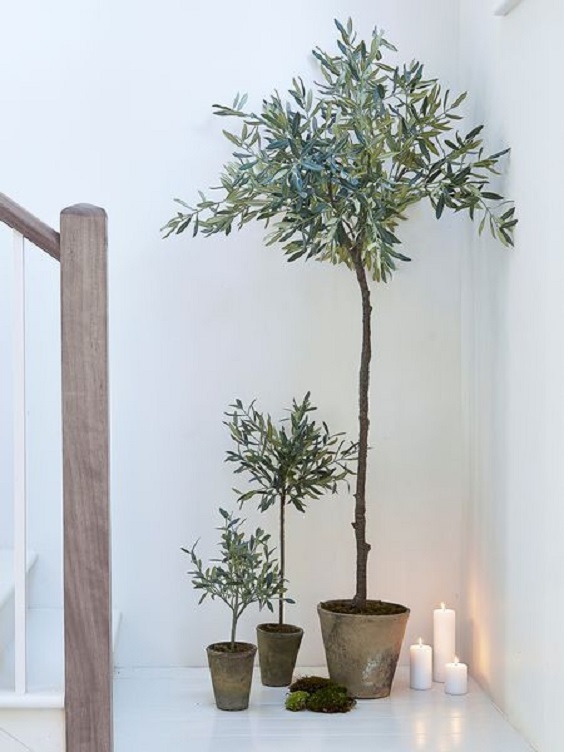 I bring in pots from the outside in, my little olive trees in terracotta pots are always gorgeous for decoration and this Christmas week I have also resprayed my Moroccan silver lanterns and filled them too with fairy lights ready to bring some post Christmas cheer back into my home. 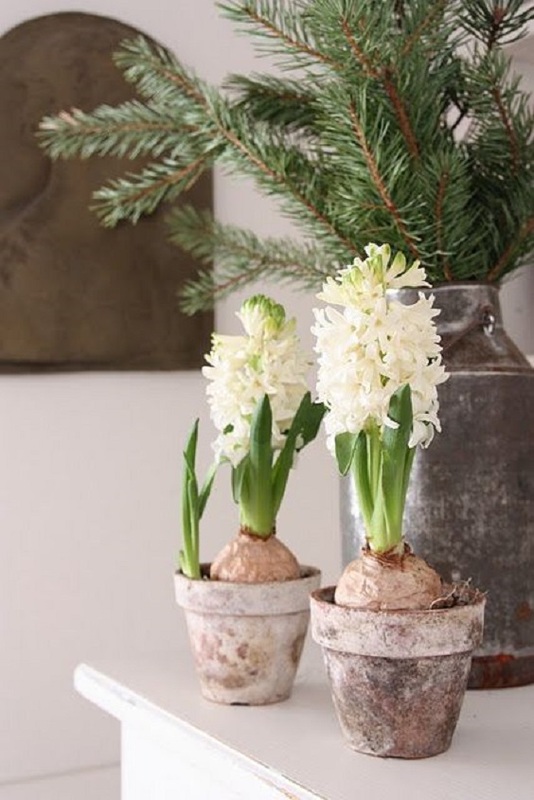 I hope this inspires you with some post Christmas decorating for the winter months before spring arrives. Again my motto is clutter free and always keep it simple!